Chicken Fried Steak made with a seasoned buttermilk crust topped with an easy, perfect milk gravy made in less than 45 minutes! 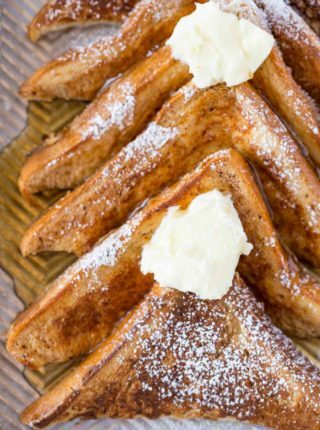 We love easy breakfast recipes including yesterday’s Eggs Benedict, French Toast and Cinnamon Rolls as we starting preparing for all the holiday family breakfasts and brunches! 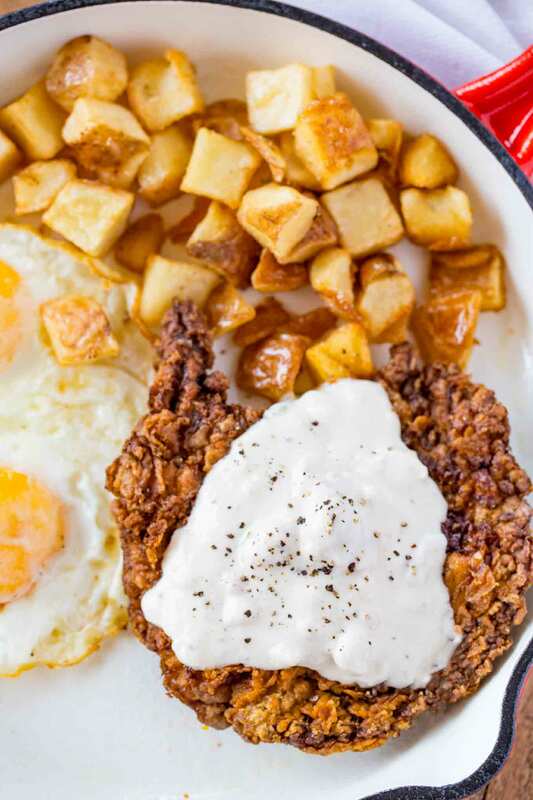 Chicken Fried Steak is the second breakfast recipe this week I’m posting in an effort to bring breakfast recipes back to the blog and make them easy enough to impress all your soon to be house guests. Plus this is the ultimate in comfort food for breakfast. And no there’s no chicken in the dish. It’s meant to mimic the idea of the coating of fried chicken. There’s actually a new trend going around for chicken fried chicken too where chicken thighs are pounded thin and cooked in the same way. 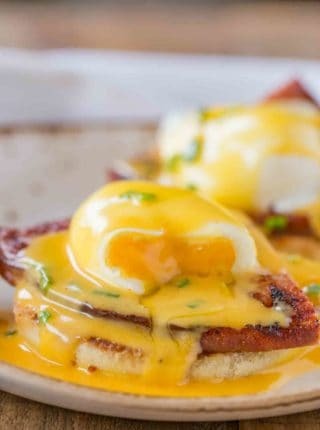 When served for breakfast it’s classically served with hash browns and over easy eggs. When served for dinner it’s classically served with mashed potatoes, green beans, ears of corn or coleslaw. 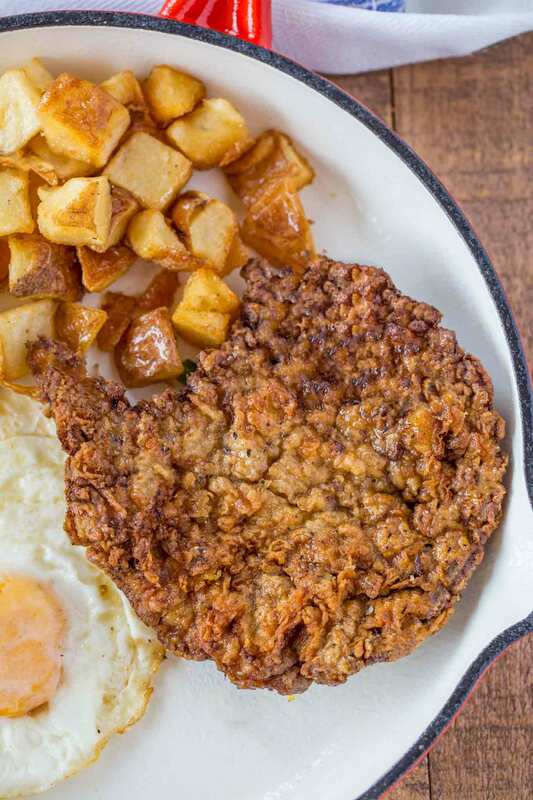 Chicken Fried Steak is the fifth most popular order in diners for breakfast (pancakes are the most popular) and now we’re going to make them at home to save you a ton of money. The classic cut of beef in chicken fried steak is cube steak. The cube steak is pounded thin to tenderize the beef because the cut is tougher than most steaks. The idea behind the use of the cube steak is that people making chicken fried steak used less expensive cuts of beef. You can of course use a more classic steak cut of beef, I’ve even used ribeyes over the holidays when I buy a standing rib roast for my favorite Prime Rib (you would too, around Christmas the rib roasts are 5.99 a pound which is about what you’d pay for cube steak). Using the leftover fat from the cooking of the steak you just have to mix with flour, salt, pepper and garlic powder before adding in the milk slowly. The trick to making a great gravy is taking the time to whisk in the milk to the hot oil slowly. Add it in in the slowest stream you can while continuing to whisk the mixture. Don’t add too much milk at once you want to maintain the mixture without breaking it. We use garlic powder in the recipe because I like a creamy gravy without bits of garlic to bite into, but with all the garlic flavor. You can also add in onion powder if you’d like (1/2 teaspoon) but the recipe doesn’t need it. If you want to make the gravy even richer you could make a cream gravy by using half milk and half heavy cream. 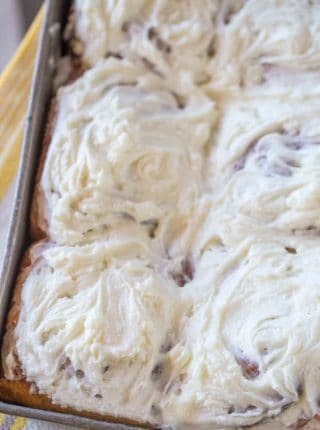 You can also use half and half, but the use of milk in this recipe is going to make it delicious enough you won’t miss the cream. Chicken Fried Steak is pan-fried in a heavy skillet (cast iron would be great) on medium-high heat rather than making it deep-fried as it is done in most diners. After you dredge the steak in the flour mixture for the final time its best to let it rest for up to 10 minutes to allow the breading to adhere. I let it rest on a cookie sheet or a wire rack. Once you cook the steak do not put it on a towel-lined plate, this will cause the bottom of the steak to steam. Steam is the enemy of a crispy crust, put the steak on a wire-rack to allow it to sit and wait while you finish making the gravy. The steak will be perfectly hot inside while the outside stays crisp. 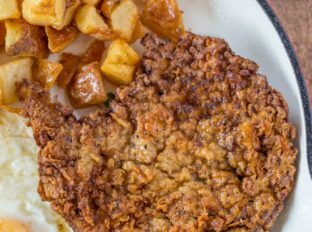 The recipes are functionally mostly the same, but the main difference is that country fried steak in topped with a brown gravy while chicken fried steak is covered with a white cream gravy made with milk. If you need to keep the steaks warm before guests arrive or people are ready to eat keep them on the wire rack over a cookie sheet in your oven at 200 degrees for up to 20 minutes. The gravy will thicken a bit as it sits so if you are waiting to serve the food just add a touch more milk and whisk it together right before serving. Season the steaks with the salt and pepper and pat the steaks dry with a paper towel. In a small bowl whisk together the egg, baking powder, baking soda, hot sauce and buttermilk. Put the steaks in the flour mixture, then into the egg mixture, then back into the flour and let it sit on a cookie sheet for 10 minutes. Add 2 cups canola oil to a large skillet and heat to 325 degrees and fry the steaks for 4-5 minutes on each side before removing to a cooling rack. Drain most of the fat but leave 1/4 cup of it and keep the heat on medium. 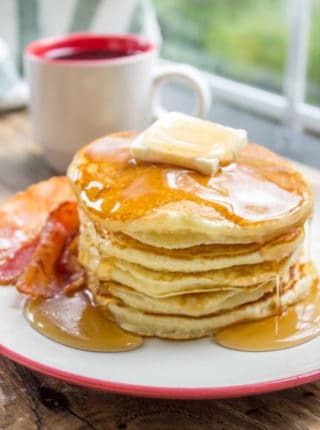 Add 1/4 cup of flour, kosher salt, black pepper and garlic powder to the pan and whisk well, cooking the flour for 30 seconds before pouring in the milk very slowly while whisking the milk until its combined before adding more until the whole mixture is even and thickened, about 6-8 minutes. Can you use the same recipe for chicken fried chicken? yes! but I do also have an awesome fried chicken recipe coming in a couple days! I made this recipe exactly like it said and the only complaint I have is I would decrease the hot sauce in half but I used tobasco and maybe that was wrong. I have an a wimpy mouth and I couldn’t finish the steak because It kept getting hotter and hotter. But besides my wimpy mouth, this was the best chicken fried steak I’ve ever made. I love how it Stayed crispy until the last bite. The flavors in the gravy and the steak were amazing. Thank you for sharing. Question..for the dredge, what is the “flour mixture” ? The recipe instructions are unclear. Thanks.. Sorry for the confusion. The “flour mixture” is just flour. This gravy recipe must be incorrect. It calls for 2 cups of oil which should probably be 1/4 cup of oil as it calls for 1/4 cup of flour and gravies are usually made with a 1 to 1 ratio of butter (or oil) to flour. You’ll use 2 cups of oil to fry the steaks. Once done, you’ll drain all but 1/4 cup of the oil to use to make the gravy (step 6). Hope this clears up any confusion. Mmmm, this looks so stinking good. I want to jump up and make right now!! Girl, you have me drooling. Oooh I love chicken fried steak, but have never made fried steak at home. This was sooo with a baked potato. Thanks for the recipe! This was so good! It wasn’t as heavy as other cfs I’ve tried. Thanks for another great recipe! You’re welcome Julie! So glad you enjoyed it! Omg. What a fab recipe! This has been added to my new weekly dinner rotation! I love chicken fried steak – and your recipe is one of my all time favorites! So delicious!